September 1, 2015 September 1, 2015 daencLeave a Comment on It’s a Bird! It’s a Plane! It’s a…Tired Teacher? It’s a Bird! It’s a Plane! It’s a…Tired Teacher? I was thinking this weekend about those shirts and memes that say “I Teach. What’s your Superpower?” Cute, yes, but also a dangerous message. Because, even ten years in, after one week back at school, nothing is more clear to me than just how very human I am. I am not, in fact, superhuman. Nor should I be. My teaching? It’s been on point. I’ve spent the week helping my students feel safe and supported,while also challenging them. I’m already seeing the payoff of that work in the attitudes of my kids, and it feels exactly right. But the physical and emotional toll has been pretty intense. I’m so physically tired. 5:00 a.m. will feel better as I get more used to it, but yeah…it takes some getting used to. And I’m even more emotionally tired. I’ve had to introvert so hard this weekend, just to restore my equilibrium. I’m expending more emotional and social energy than I actually possess as I form relationships with, entertain, and inform 120 amazing humans for 10 hours a day. I absolutely love it. It is completely worth the exhaustion. But exhausting it is. Then, after a couple of weeks, I remember: I’ll be behind for the next ten months. And it’s okay. I’ll just do the best I can. I say all of this now because it took me ten years to learn that this exhaustion, this overwhelm, this imperfection, is nothing to be ashamed of. I say it because I imagine that some of my teacher friends are feeling the same way, and I want them to know they aren’t alone. I say it because every day I get to be surrounded by some of the coolest humans in existence—teachers—and I want them to survive and thrive in the impossible environment of our struggling and beautiful public schools. A superhero would do it all perfectly. I won’t. Because I also need to be someone who naps, and watches Netflix, and exercises, and spends time with my family and friends. 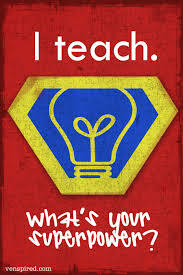 Teachers don’t need to be superheroes, y’all. We need to be quality people who love our kids and our subjects, and who will do the best we can while acknowledging our limits and caring for ourselves and our families. I teach. I’m human. And I’m proud to be both. Holly Jordan is in her tenth year teaching English at Hillside High. She’s a proud member of DAE. Previous What’s Good at Jordan High? Next What’s Good About The School for Creative Studies?